If you were to ask me which food I miss most when I am away from Switzerland for a long time, many people think I would say chocolate, but actually, it’s something else entirely: cheese and bread. Don’t get me wrong: there are nice cheeses elsewhere in the world. But for me, there is nothing to match a “Kaltbach Le Gruyère AOC, höhlengereift” or a “Luzerner Rahmkäse” (as examples). You also get such wonderfully tasty and diverse bread in Switzerland. Rather than a white bread French-baguette style, we are talking more full grain bread, bread with seeds or nuts in it, bread with dark flour, etc. This brings me to a match made in heaven: homemade Fondue. So why should you love homemade cheese fondue? Most Swiss supermarkets sell pre-prepared fondue mixes that are easy to prepare and taste pretty good. However, you can tailor your fondue to your own tastes if you choose your own cheeses to mix. If you already know you like a stronger, spicier cheese mix, then you can choose something like the afore-mentioned “Gruyere AOC höhlengereift” or the “Appenzeller Extra-Würzig”. 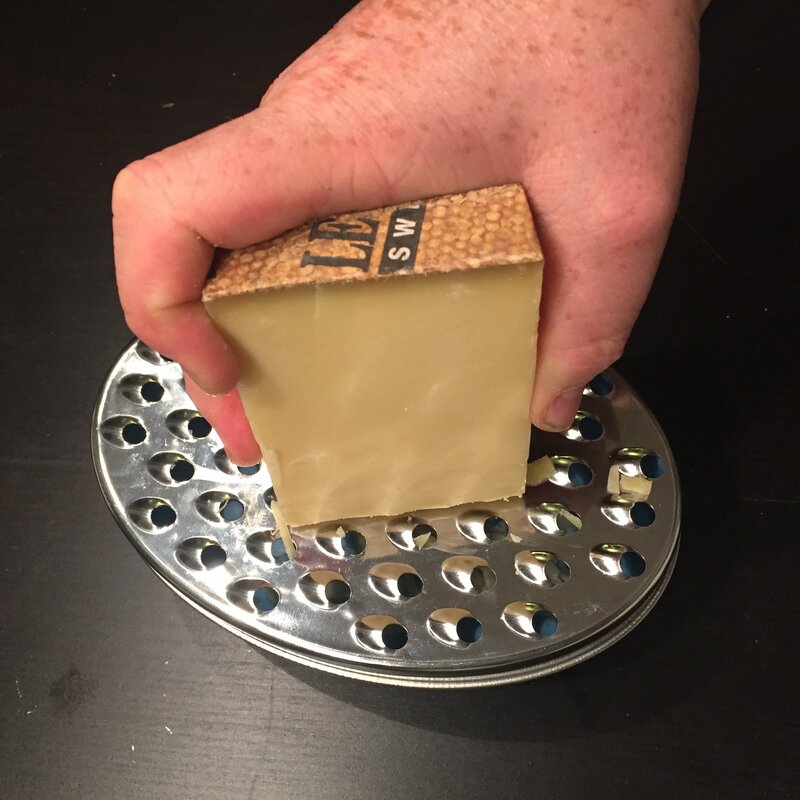 Hint: when looking for a spicy and strong cheese in Switzerland, just look for the words “rezent”, “würzig”, “kräftig”, “reif” and/or “surchoix”. On the other hand, if you would rather have a bit of a milder flavour, go for cheeses with the words “mild” and “doux”. The three classic kinds of cheese for a fondue mix are Emmentaler, Gruyère and Appenzeller. There are no limitations to your creativity though. For example, I love a bit of “Luzerner Rahmkäse” in the fondue as it is creamier and softer than the other cheeses. Click here if you want to read some more of our Switzerland posts. To prepare a fondue yourself is not rocket science. All you need is a Grater and all the right ingredients and voila: Fondue. Well, it’s not that simple but still, you don`t really need any experiences as a cook to prepare a fondue. I’ll show you exactly what you need for a fondue and how you prepare it below. As you basically only need one pot to melt the cheese, the cleaning up is quick to do. Fondue is one of the most sociable meals you can get in Switzerland. As there is only one pot of melted cheese in the middle of the table, everyone has to be huddled around the pot in order to eat. You need to be looking at what you are doing with your hands, so it doesn’t lend itself well to staring at a TV or a phone screen. And it’s grim and cold outside so nobody will want to leave. That’s when you can tell them that there are old traditions and rules for eating a fondue. The most important one of those is the “punishment” for dropping one’s bread in the pot. One of the original consequences was that the man who loses a piece of bread in the fondue has to buy drinks for everyone on the table, whilst the poor women who dropped the bread had to kiss all the guys. In modern times, the rules are likely to change depending on who is hosting the fondue. The best thing to do is agree on the forfeit before you start eating and then having a good laugh at the expense of whoever drops their bread. Whilst making sure that yours is firmly on the end of your fork. If you want to enjoy fondue with some other people, but don’t know anyone yet in Switzerland, then something like a Culinary Tour from Zurich with Traditional Swiss Cheese Fondue Dinner might be exactly the right thing for you! I mean, what’s better than fondue, chocolate and Swiss landscapes? Click here to check the current price and availability. Click here if you shop from outside of the USA. One fondue set, with a burner and four fondue forks. Prepare the table with placemats (cheese drips, you have been warned), and one small plate and one fondue fork each per person. Cut the bread into strips and put them in one or two large bowls on the prepared table. 3. Rub the complete inner surface of the Caquelon (fondue pan) with the garlic, then finely cube the garlic and put aside. 5. Let the cheese/wine mix slowly melt at medium heat. Stir it with a figure-8 movement all the time. 6. As soon as the fondue has a smooth and creamy texture, add the kirsch, the nutmeg, the paprika and the herbs and stir for another 2-3 minutes. 7. Serve the fondue to the waiting guests while still stirring it. Eat immediately. Instead of white wine, you could use also Prosecco or Champagne, that gives the fondue a bit of an extra kick. If you have any questions about fondue, then don’t hesitate and ask me in the comment section. Or if you are a fan of fondue like us, feel free to share your own recipe as well! Click here to find out more about cooking schools around the world.